It's well known that I am a fan of the underrated stars such as The Brian Kendrick, Gregory Helms, and I've done articles on The Revival and American Alpha before their names were launched into the stratosphere. But I'm not going to do that this time. 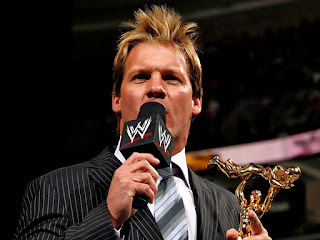 I want to talk about how amazing Chris Jericho is at what he does. I remember when Jericho left us in 2005. It was a You're Fired Match against John Cena for the WWE Championship. Around that time, Jericho had been more interested in his music career and he needed a break from the ring. He intended to let his contract expire and he went through with it. Fast forward to Wrestlemania 23. Two years later. John Cena and Shawn Michaels deliver a near perfect match. Then Cena and Michaels do it again for an hour in London. I don't know how, but they somehow out did their Wrestlemania encounter. These 2 matches were the first 2 matches Jericho had watched since leaving in 2005. After seeing that he calls Vince and they work on his return. November 19, 2007. Jericho returns. The building explodes. He lays down the challenge for the WWE Title. Everyone's excited. Then he doesn't win. He did win another Intercontinental Championship, but he was basically running in the same place before he had left. Fast forward even further to April of 2008. Jericho sticks his nose in the business of Shawn Michaels and Batista who are in the middle of a feud over Ric Flair. Michaels kicks Jericho's head off and Jericho asks to be added to their match at Backlash to make it a triple threat. Instead he's made Special Guest Referee in a match that Michaels wins by faking a knee injury. A few months later, Jericho's character shifts. He calls out Michaels and the fans for cheering him no matter what he did. He lied to them about his knee, he had retired their hero Ric Flair, and he had assulted Jericho many times. Nothing Jericho said was false information. They still booed him. He assaulted Michaels and smashed his face through the Jeritron 6000 beginning the mean streak that was to come. He began to wear suits. He completely rid himself of the juvenile insults and all the great things that made him the Y2J we all knew and loved. He took no responsibility for his actions unless it made him look good. His promos were serious and words cut like knives. He was better than he had ever been. Moving forward to July 20, 2008. The Great American Bash. Things between Jericho and Michaels were heating up after Michaels cost Jericho his Intercontinental Championship at Night of Champions. They were scheduled to face off that night and it was brutal. 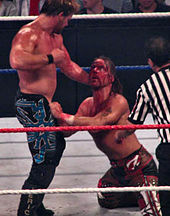 Jericho went after the damaged eye of HBK and bloodied him. I enjoyed every second of it because this was the point that showed that Jericho was a completely new guy. He had beaten Shawn Michaels, the guy he used to look up to, to within an inch of his life. 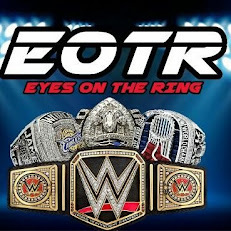 This event is also notable because the night after this event, the PG ERA in WWE had officially begun. I think many of us thought the rivalry between HBK and Y2J was over. Y2J had beaten Michaels definitively and it had been going on for 4 months. At SummerSlam, he interrupted Michaels in the middle of his retirement speech and belittled Michaels. HBK said Jericho would never reach his level of success which led to Jericho accidentally punching Shawn's wife when he ducked out of the way. What did Jericho do the next night? He blamed Shawn for putting his wife in that position. This set up an Unsanctioned Match at Unforgiven between the two, which was absolutely fantastic. It's my favorite match between the two of them. Shawn won the match, but Jericho's night wasn't over. He snuck into the Championship Scramble to replace CM Punk and stole the World Heavyweight Championship. Jericho was on top of the world. He would then go on to face Shawn in a Ladder Match at No Mercy. 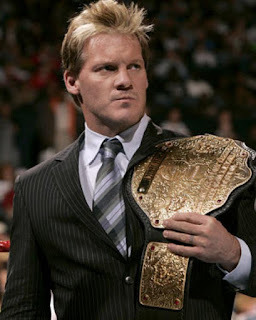 The match was a near classic as Jericho was able to successfully retain the Big Gold Belt. He would then go on to trade the title back and forth with Batista then John Cena to end the year. Jericho had a fantastic year. He was a 2 Time World Heavyweight Champion and the Intercontinental Champion. He participated in the Feud of the Year with Shawn Michaels. He was rated the 2nd best Wrestler by PWI in 2009 after his big year. His character change was one of the finest heel turns in wrestling history. A self righteous honest man who thought that he could do no wrong easily made him the most hated guy in the company. Add in the fact that he was tearing down one of the most loved men in the company and he had enough heat on him to burn buildings to the ground. This is easily my favorite Jericho character of all time. He was tired of being stagnant so he actually did something fresh and new that most of us had never seen before. His success didn't stop there. The character took him to new levels even having him win a record breaking 8th and 9th Intercontinental Championships and the Unified WWE Tag Team Championships in 2009 with the Big Show. From 2008-2010, I don't think there was a more successful star than Jericho. He won 3 World Championships, 2 Intercontinental Championships and 2 Unified Tag Team Title reigns. He was the first to complete the Grand Slam with the available titles in that time frame. He also put on some of the best matches of his career. Against Shawn Michaels, he put up Star Ratings of 4.00 (Judgment Day), 3.75 (Great American Bash), 4.25 (Unforgiven), and 4.5 (Ladder Match at No Mercy). He followed that up in 2009 in a feud with Rey Mysterio that never saw a single match fall under 3.5 stars. I guess my only complaint would be that he never held the World Heavyweight Championship long enough. He held the belt twice in 2008 and only held it for about 2 months combined. However, his success in the midcard and tag team division in 2009 showcased his versatility and basically showed that you can keep your top stars away from the main event scene and not worry about them losing momentum. Let Jericho's last lengthy run be a glowing example of how you book veterans.